Not many pundits talk about the changing of “of” to “to” in the phrase President of the United States. The formula “so help me God” is traditionally added. In the first instance, to makes it clear that the ambassador belongs somewhere else. He may be attached to the United States, but it’s as an outsider. In the second instance, the of makes it clear that the ambassador is carrying on the work of the United States. So why would Chief Justice Roberts come up with the unprecedented “President to the United States” while delivering the oath of office? Could it have been an example of parapraxis? As senator, Obama objected to the appointment of Roberts to the Supreme Court. It’s not unreasonable to think that Roberts was less than happy to have the task of swearing Obama in as President. Both of and to have myriad applications in English, but in these two phrases, of has the force of joining, while to has the effect of distancing. Could there have been an unconscious wish to distance Obama from the office? The preposition switch may not be evidence of parapraxis, but the fact remains that Roberts did mess up the oath. Poor guy! He’s earned himself forever the distinction of being the first justice to to stumble over the 35-word oath in the course of sixty-four years and eleven Presidents. G.H.W. Bush did the same thing and Justice Rehnquist didn’t miss a beat. 2. To be on the safe side, Roberts re-administered the oath in private, the day after the inaugural ceremony. Two other Presidents have received a double dose of the oath: Chester A. Arthur (1829-1886) and Calvin Coolidge (1872-1933), both Vice-Presidents succeeding a deceased President. Arthur took the oath in his own home, at midnight, upon receiving word that President Garfield was dead. N.Y. Supreme Court justice John R. Brady administered it, but two days later Arthur swore the oath a second time. Calvin Coolidge was in Vermont when President Harding died in California. Coolidge’s father, a notary public, administered the oath at 2:47 a.m. Next day Coolidge returned to Washington where he repeated the oath before Justice A. A. Hoehling. It’s interesting that few people are commenting on Justice Roberts’ asking “So help you God?” (you, questioned) rather than offering “So help me God” for repetition. The errors were all Roberts’. Great site. It seems to me that the next step for many–after learning to write well–is publishing. I would like to offer my book for review at your site: “The Right Way to Write, Publish and Sell Your Book.” http://www.matilijapress.com/rightway.html. Author of 29 books (and counting). OK, OK – not to make excuses for the people, but give it some thought. Two people repeating historic lines, at an historic time, with one of the largest (if not the largest) number of viewers to the performance (live, TV, computer and whatever else). Now if it was you or me, wouldn’t you be just a tad bit nervous? Does anybody know if these two got a run through, face to face, before the performance? Hmmmmm . . . ? It’s not like a Broadway play where there are hopefully more than one performance. That is just another perspective. My own, humble, meager one. Roberts is an idiot. I believe what he did was intentional. If he didn’t know the oath, although its only like 30/40 some words, he should have had a cue card. 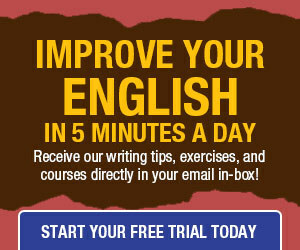 This site is still “Daily Writing Tips”, isn’t it? I was confused when I opened my feed reader this morning. I agree it’s interesting to look at how the error changed meaning. But long-winded speculation on political intentions? Please. Save it for your personal blog. It will focus on Language and Popular Culture. @Maeve That ooks very cool. Hope I didn’t come off as too irritated; I rely on this site for good daily tips. I respectfully disagree with Jared. I enjoyed reading the post and learning a few things about English, politics, and history. After all, it’s not a grammar text book, it’s a blog, right? So, nothing wrong “speculating” a bit, if the author feels so. Thank you, Maeve. Technically, the Constitution does not include the ‘state-your-name’ part. The relevant paragraph says, “Before he enter on the Execution of his Office, he shall take the following Oath or Affirmation:– ‘I do solemnly swear […]'”. I thought it was a teachable moment! Yes, Charlie. It was a very nervous and exciting moment for a many people — especially Obama and Roberts (lots of firsts were taking place on that inaugural stand). And yes, Carolyn. Sometimes a mistake is just a mistake. Let’s remember that the speaking errors these esteemed gentlemen made were not only televised nationally; the whole world was watching! I’ve said it before (and will probably say it again): Ain’t words great? Just one little change in word choice can make a major difference in meaning. Definately a blunder. On the other hand, many of our clients who speak English as a second language have difficulty with pronouns. 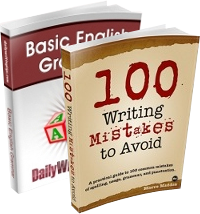 We see “of” and “to” mistakes almost as frequently as “on” and “in” mistakes.